Christian Flemming's goal in the 20th minute lifted Moanalua over reigning Oahu Interscholastic Association Division I champion Kapolei, 1-0, in the quarterfinals of the league playoffs Tuesday evening at Kaiser Stadium. "It was (on) a throw-in," Flemming said of his goal. "Our player didn't have it at first, he had to fight for the ball, won it, (then he) hit the ball in and in the end it came to me and I put it in the back of the net." Flemming said taking the early lead was pivotal if his team wanted to beat the Hurricanes, who was ranked sixth in the ScoringLive/Hawaiian Electric Boys Soccer Power Rankings heading into the game. "We knew from the get go we had to score early, so I knew when I saw that ball go in that it might be one of the only chances we were going to get," said Flemming, a sophomore forward/midfielder. Na Menehune (8-2-2) moves on to face No. 4 Kaiser Thursday night at Kapolei's Alvin Nagasako Sports Complex. The Cougars (10-0-1) defeated Castle, 3-0, in the quaterfinal game after Moanalua's win. 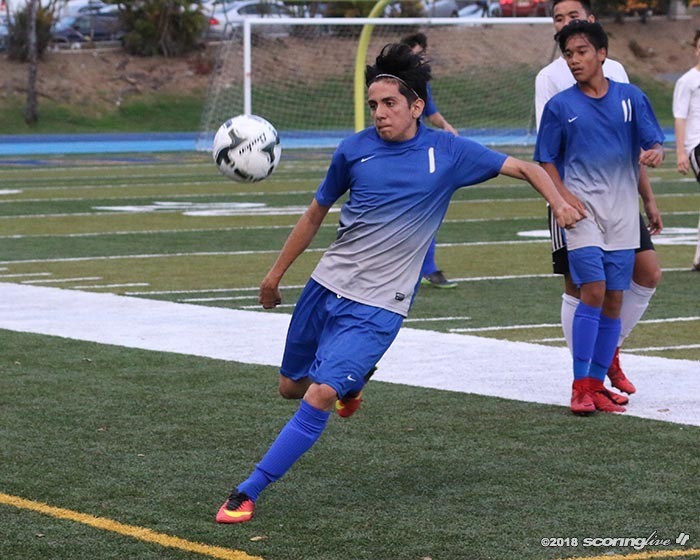 Motoki Sato, Noah Mokulehua and Aaron Rivas had goals to lead Kaiser over the Knights. The semifinal matchup between Moanalua and Kaiser Thursday is slated for 5:30 p.m.